Cannabis really is medicine... Want to add cannabis skills to your resume? 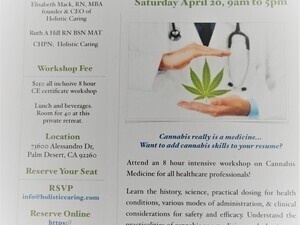 Attend an 8-hour intensive workshop on Cannabis Medicine for all healthcare professionals! practicalities of cannabis as a medicine and a business. years of research and experience so you can teach them! All are welcome healthcare professionals and nonprofessionals.